Good morning all! It's Thursday, which means it's time to see what I've been cooking up from my thrifted recipes! 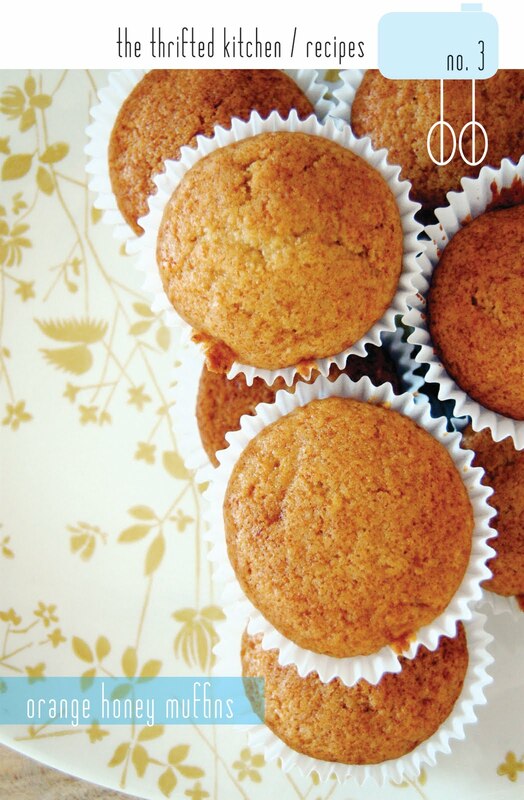 Last night I made Orange Honey Muffins, a recipe that comes from a calendar I spotted last week. Overall it was pretty good; I felt the muffins were a bit dry, and I think the amount of honey needs to be cut just a little (for me it was too overpowering). The hubs thinks they'd be good with a little softened butter or cream cheese (what isn't?! ), but either way you bake it, they're certainly a yummy treat to wake up to in the morning! Sift the baking powder, salt and flour together. Mix with whole wheat flour. Combine shortening, orange juice and rind, honey and egg. Add all at once to the flour. Stir enough to dampen. Bake in well-greased muffin pans for 20 minutes in oven 400 degrees.